Alderman George Adams, died 1st April 1908 and his wife Catherine Elizabeth Dyer Adams, died 15th August 1881 . Death of Catherine Elizabeth Dyer Adams Cornishman August 18, 1881 p 5. Death of George Adams Cornishman April 9, 1908 p 5. TDF 21/11/08 (the day before the window was unveiled!). Insertion, unveiled 22nd November 1908 , dedicatee, Western Morning News November 23, 1908 p 4 (short notice) Western Morning News November 23, 1908 p 4 (includes maker, detailed description of subjects), West Briton and Cornwall Advertiser November 26, 1908 p 4, Royal Cornwall Gazette November 26, 1908 p 4. Maker, dedicatee, subjects, Truro Diocesan Kalendar 1910 p 165 ( 22nd November 1908 ). Heard & Sons, Truro. To the Glory of God and in memory of George Adams, J.P., of Home Park, Saltash, third son of Thomas and Tebitha Knill Adams of Laneast and Badharlisk, Egloskerry. Born November 5th. 1823 ; died April 1st. 1908 , aged 84 years. Also of Catherine Elizabeth Dyer, his wife, born November 23rd. 1836 ; married April 29th. 1875 ; died August 15th. 1881 , in her 45th year. A sower went forth to sow ( Matthew 13:3). 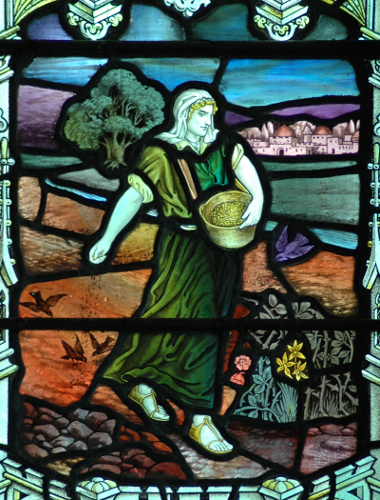 They of Bethshemeth were reaping their wheat harvest in the valley ( 6:13). So she gleaned in the field until even ( Ruth 2:17). Left-hand light: the parable of the sower. Inner two lights: the harvest at Bethshemesh. Main scenes. Photograph copyright © www.asnapintime.co.uk, used with permission of Ryan Smith. Left-hand light: the sower, detail. Photograph copyright © www.asnapintime.co.uk, used with permission of Ryan Smith. Second light: Bethshemeth, detail. Photograph copyright © www.asnapintime.co.uk, used with permission of Ryan Smith. Third light: Bethshemeth, detail. Photograph copyright © www.asnapintime.co.uk, used with permission of Ryan Smith. 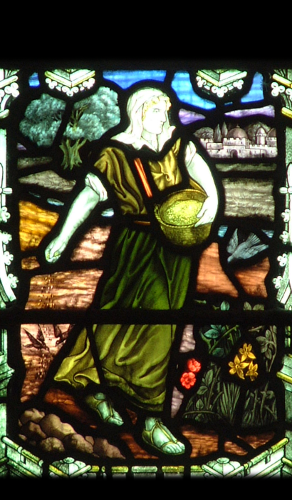 Right-hand light: Ruth, detail. Photograph copyright © www.asnapintime.co.uk, used with permission of Ryan Smith.